Prepare the Simple Syrup: In a small saucepan over medium-high heat, combine 1 cup of the water with the sugar in a small saucepan. Bring to a boil. Add the hot cherry peppers, lower the heat and simmer for 10 minutes. Remove from heat and set aside. To make the cider: In a large pot, combine apple cider, orange slices, and whole cloves. Bring to a boil over high; reduce to a simmer and cook 5 minutes. Remove from heat and strain orange slices and cloves out. Stir rum into cider. Add Hot Cherry Pepper simple syrup until desired heat level and sweetness is achieved. 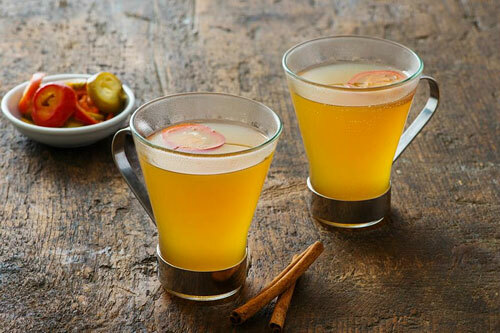 Serve warm with a cinnamon stick to garnish each drink and a slice of hot cherry pepper.